It's time for me to once again try a sample sent to me by the nice people of Clydesdale, one of Swedens top importer and seller of whisk(e)y! 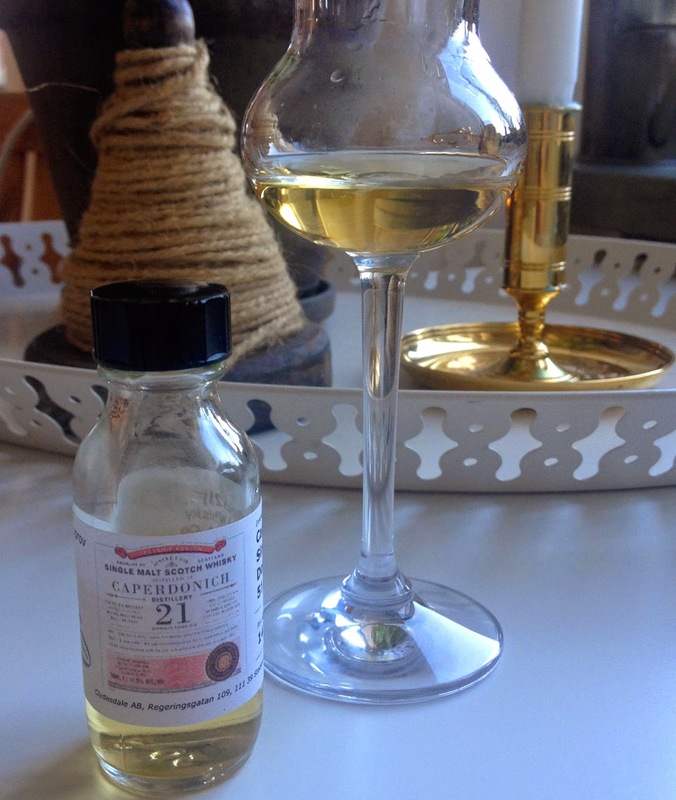 This time I will try a 21 year old Caperdonich bottled by Douglas Laing & Co. in their series called 'Old Particular'. 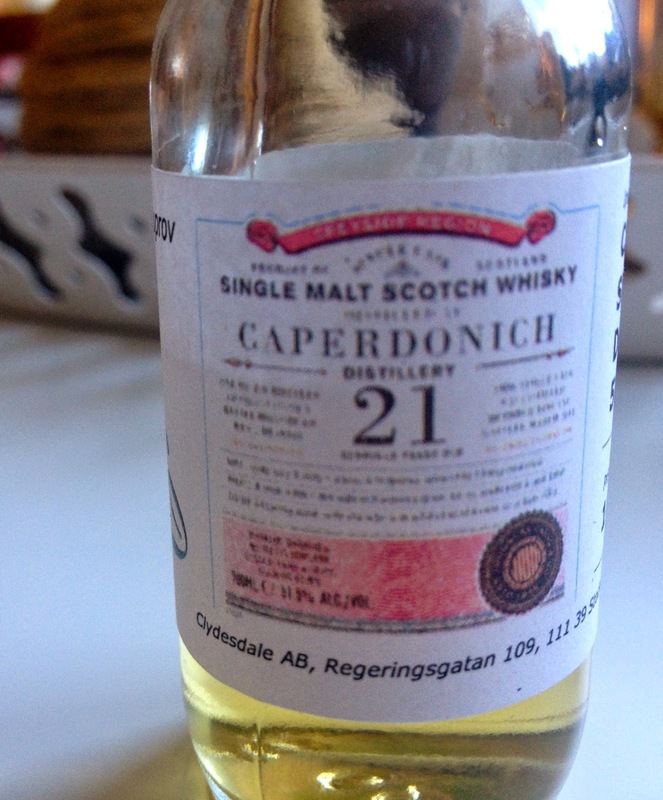 This is the first Caperdonich I try and from what I understand the distillery was closed in 2002! The whisky is from a single refill bourbon hogshead and the number of the cask is DL10282 and it gave 276 bottles at 51,5% ABV. The cask was laid down in October 1992 and bottled in March 2014 so it sure is a recent release. For swedish fans it will be available on the 2nd of June at the state monopoly (number 84389)! Really rich and fat, creamy, soft and mature, you can really feel that this is an oldie! We have sort of dried slices of apple slowly slowly boiled in sugar syrup or something like that. But the apples have almost no acidity. Hardly nothing in the ”citrus-sphere” for being a bourbon hogshead… but rather only soft things such as vanilla and there is also traces of banana candy and peach candy. Incredibly soft in the background we find pistachio crème (the filling that is sometimes in cinnamon buns) and honey. Let me tell you friends, this is a real treat on the nose! Mmm! Such a treat also on the palate! Those of you who happen to have around €150 just lying around your house, don’t miss this one!! It’s so soft, and it really does caress the tounge… Starts of on dark honey, moving on into a kind of mix of the sugary-syrup-boiled apple slices and some kind of soft liquorice. The pistachio creme is there, so is a really soft lemon marmelade. Green marzipan is mingling with whipped vanilla cream. On the finish we happen to have just a zip of really soft coffee beans dipped in quite milky (light) milk choclate… I don’t think I’ve tasted such a soft whisky before, there isn’t a trace of alcohol-sting on the nose nor the palate, absolutely beautiful composition! A big thanks once again goes to the nice people at Clydesdale for the oppurtunity to try this beautiful whisky! Friends! Yesterday something really nice happened to SamuelWhisky! A package of no less than seven samples arrived in my mail-box. The package was sent from from Clydesdale which is one of Swedens top importer and seller of whisk(e)y (and more beverages). I’m very honoured to be able to taste and to review such quality whiskies as those of the Clydesdale portfolio consisting of brands such as Berry Bross & Rudd, Blackadder/Blackadder Raw Cask, Douglas Laing & Co. to name just a few. 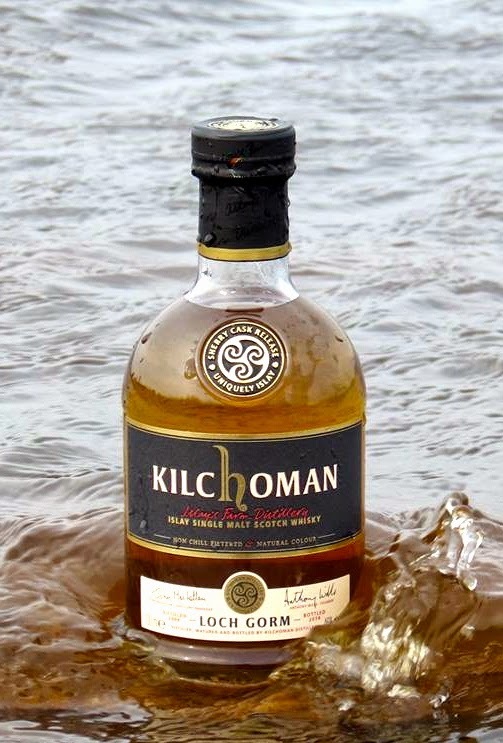 Today I will taste another brand that Clydesdale take care of, namely Kilchoman and their 2nd release of the ’Loch Gorm’! 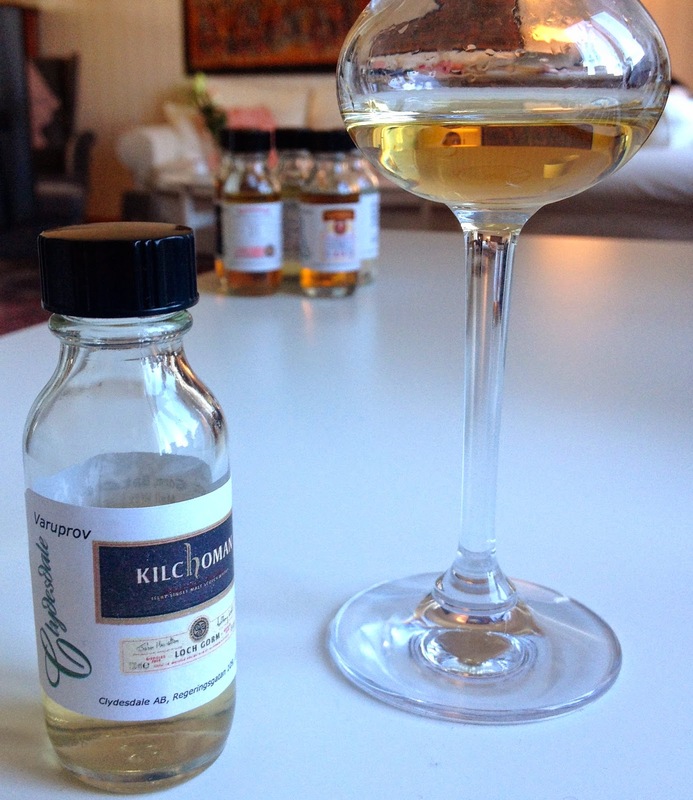 It has enjoyed it’s full maturation in fresh Oloroso sherry butts as stated on the Kilchoman website. It was distilled in 2009 and bottled in 2014. It is available basically world wide and was released in the beginning of April. The peat is in the center, and oooh, believe me this is a really kind of ”farmy” style of peat. Not ”rough” peat but very sort of out there, I’d really describe it as smoky (wet logs on the fire) and it is not often or in many peated style whiskies that I refer to peat as being smoky, but this one sure is! With regards to sherry influence on the nose, I wouldn’t really say that it is extreme, it isn’t really at the center of the attention, but maybe it’s reasonable to think that this should make an appearence more on the palate (?) On the contrary to sherry influence I’d say that we have more stuff on the bourbon side of things, something citrusy, very very acidulous in the very highest register and continuing on into a very salt fragrance… There is of course a touch of alcohol there (sort of like in matured de luxe tequila) but not as much as you could expect from a five year old… all in all on the nose, intriguing! Ooooh, very very very smoky and peppery style of peat! but before that, on the very tip of the tounge, we actually get some really salty influences indeed, almost salt licorice or even in combo with sea salt. The sherry influences I wouldn’t really say appear, at least not in terms of dried figs or raisins or so, but if it is there it is there in terms of something chocolate-ish. After the salt we do move on into a bit of rubber/burnt rubber and leather, how leather may taste I don’t know ; ) Anyway, the combo of rubber/leather/smoke soon becomes medium-dry in the mouthfeel, and yet again I’d say we are on the bourbon side of things, such as quite dry lemon-peel… The things going on in my mouth when I taste this one is really nice, the developement is quite intriguing and I have a hard time accepting that this is only five years old! And when it comes to the smoke style of peat, this is a real cracker! Once again, a big thanks to the nice people at Clydesdale for sending me this sample! Sláinte! 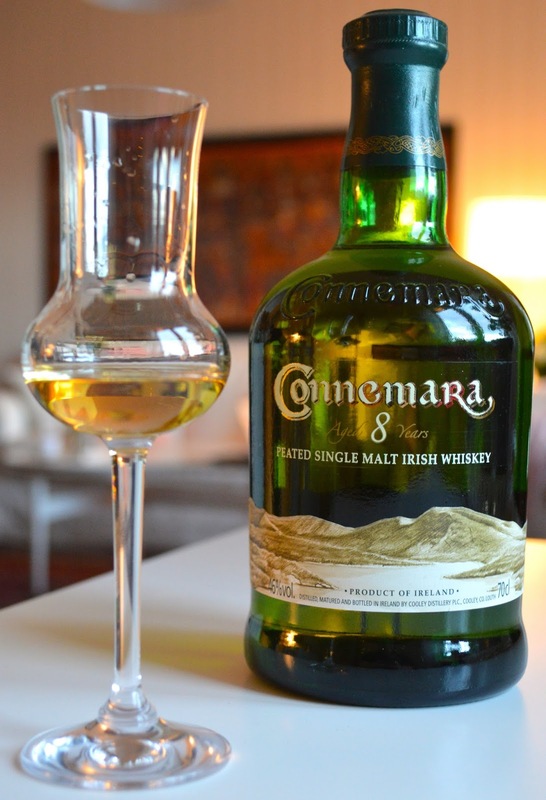 Connemara 8yo (for Sweden only) 46% ABV! Friends! 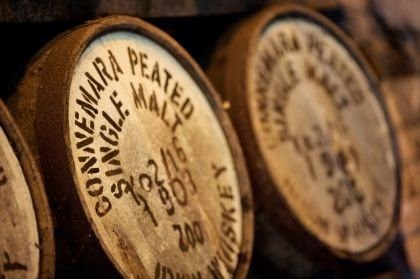 As you know I am a bit of a big fan of Connemara (Peated Single Malt Irish Whiskey)! Some people even call me a Connemara Ambassador J So today, a big moment for me has come! In October 2009, what is now known as Kilbeggan Distilling Co. (and back then as Cooley Distillery), released an 8yo Connemara for Sweden only. It had been matured in firstfill bourbon casks and was limited to 9000 bottles. The thing is that this bottling was actually released before their first ’Small Batch’ release (the Connemara sherry finish) consisting of 20.000 bottles worldwide, so this release for Sweden was a truly once-off small batch in the true sence of the concept. Now, back in those days I tried this expression a lot but I never did any tasting note of it, so I’m very happy to do that now! My friend Magnus was very kind to sell me an unopened bottle of this beauty which I was planning to open in order to finally do a tasting note, but then, even more recently a new found friend, Mikael, sold me a sample, and that sample arrived in the mail-box TODAY! J Sooo, let’s try! Aaah! Soo soft and creamy on the nose, mixed with a ”green” kind of mellow peat. Beneath that layer we have a mixture of different exotic fruits, mostly in focus though is freshly opened, almost overripe, passion fruit. On the fruity side the citric-winter-apple influences are most evident of all. Now this is precisely what I love so much about Connemara, the green almost forrest-y moss-y peat mixed with the fruity-ness… Absolutely beautiful… Now that I think about it the creamy thing in the first layer could also of course be explained as vanilla, or vanilla infused whipped cream or something dreamy like that J There is also a touch of marzipan or lightly roasted almondflakes, but this is very faint and quite far away. Okey, let’s have a taste! Mmm, nice… not at all how I remebered the palate from when I tried it (but that was years ago so no wonder)… Now on the palate, all of that excotic stuff and the apples are not as evident. There’s rather more focus on the vanilla cream, a soft but highly present peaty-ness and then what I almost always find in different Connemaras, the cacao or almost milk chocolate. You can barely notice the 46% ABV, I mean you do feel it as more than 40 but I think of it as more like 43, for me meaning that there is balance here… Actually, a thing that I have never thougth about in Connemara comes to mind, there is a very very tiny slight Cognac-ness in there, at least in this 8yo, something from the fruityness in these bourbon casks and the vanilla. Or is it the forest/moss elements that make me think of Cognac? Sort of Grönstedts ’VSOP Monopol’ (the Blue one)? Well, I don’t know but I really do like it. 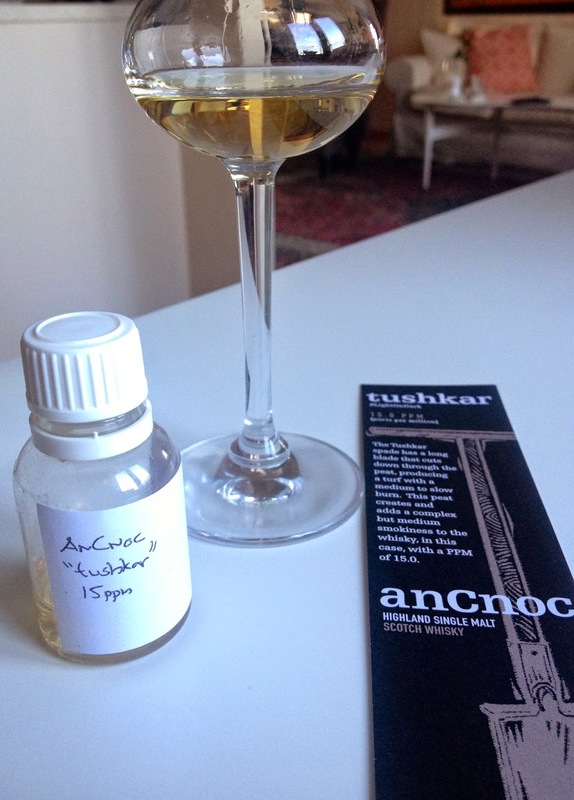 Ok friends and followers, it’s time for something really exciting, cause today I will try one of the three new peated whiskies from AnCnoc! 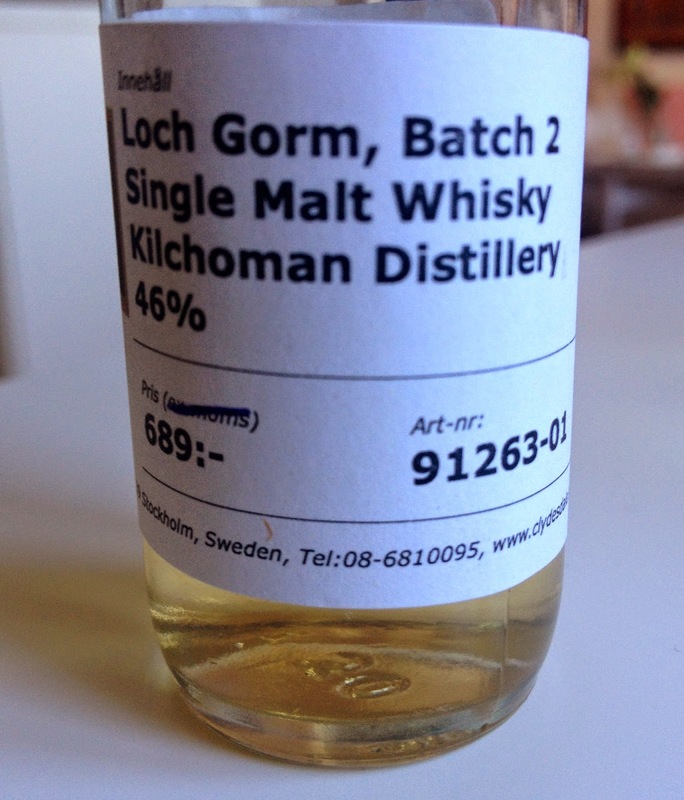 Here in Sweden AnCnocs peaty side was unveiled on the 8th of April in Stockholm. 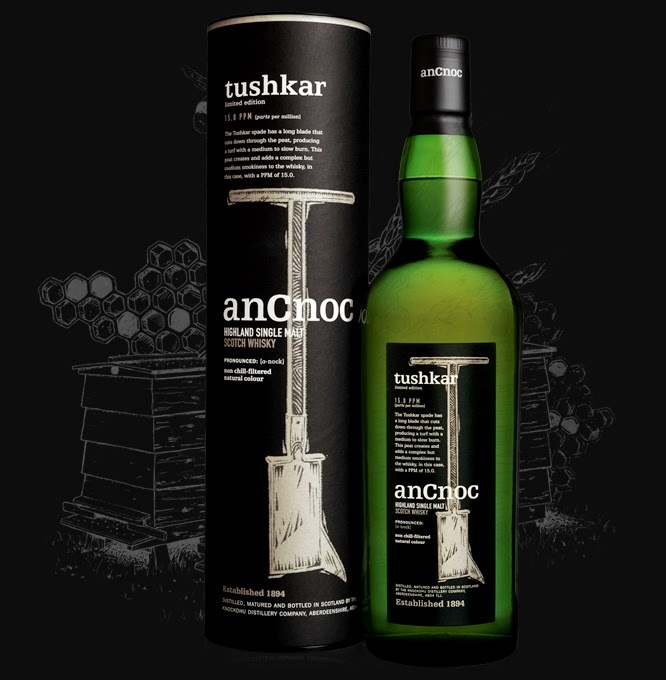 The three whiskies are named after traditional peat-cutting tools, namely ’rutter’, ’flaughter’ and finally ’tushkar’. 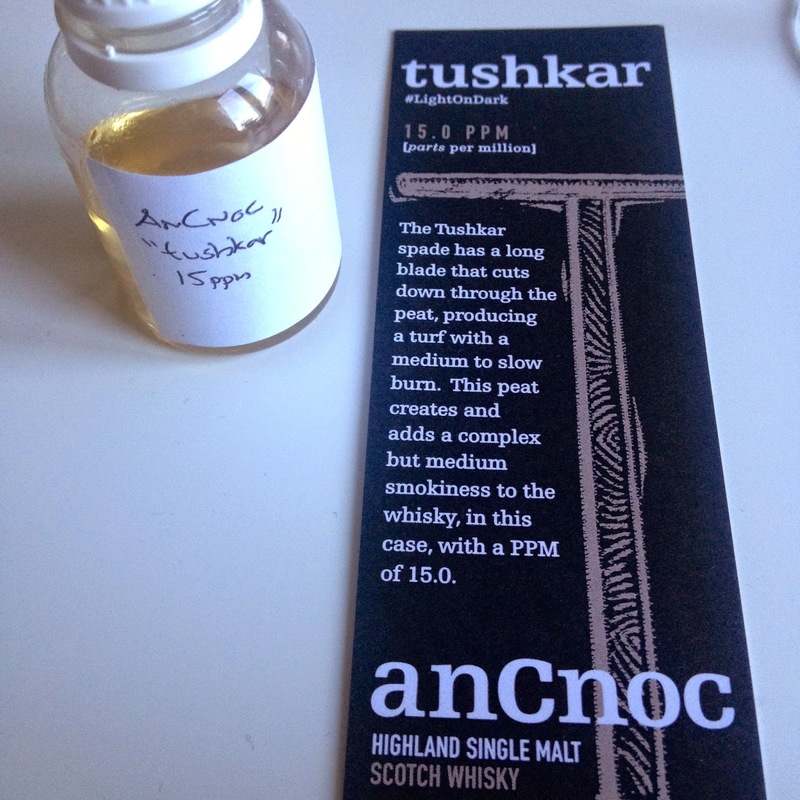 Now what is so special about them (besides the fact that AnCnoc normally don’t release their peated stock of whisky) is that the ppm stated on each version is measssured after maturation. So, from what I understand, 15ppm after maturation should mean about 45ppm in the malt before destillation. As you understand, these three whiskies are NAS (no age statements) but as far as I have learned the youngest whisky in the compositions are 8yo. They have been matured in bourbon casks. Now, ’tushkar’ which I will try today was released exclusively for Sweden a couple of days ago. ’rutter’ and ’flaughter’ which I will try later on is available basically worldwide and can be ordered for example from here. A big thanks to David of Berntson Brands for the sample which I received during the Gothenburg Beer and Whisky festival! Ok, let’s go! Oh yeah! There is a really big peat here friends. Especially compared to the what the nose promised. It’s not at all as soft on the peat on the palate as it was on the nose! This is really good! Don’t expect any island or sea salty-ness though, there is some salty-ness but mixed up with quite some touches of cacao, also in that sense reminding me of Connemara. The citric elements on the nose does not really follow through on the palate but the ”green” influences and the kind of forest/earthyness does. Really nice peaty-ness here friends and a good complement to the Islay-esque whiskies in your cabinets! Well done fellas of the AnCnoc distillery, and well done also to release a whisky exclusive to Sweden! A big thanks again to David for the sample! Sláinte!